I remember growing up as an athlete the last thing I thought about was what type of food I was eating. If it smelled, looked and tasted good I was all in! I was never taught about the purpose of food and how it’s your body’s fuel source. Think of your favorite sports car and the engine of that car. High performance engines need high performance fuel to optimally perform. Your body works just like your favorite car and as a tennis player your body is your high performance engine. Basically the higher quality food you put in your body the better you’ll perform on the tennis court, as well as, during training, competition and recovery. Maximizing your health results and performance on the court all comes down to understanding your food foundation. 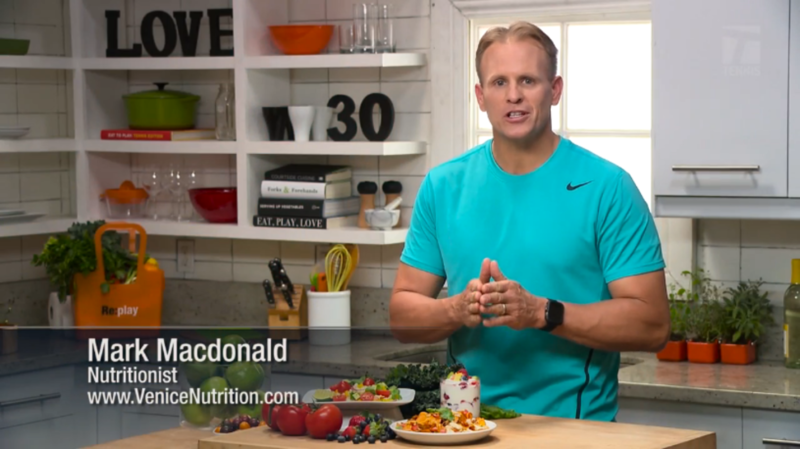 It’s time you start eating like a tennis champion! Whatever your goal: better recovery, lose weight, burn fat, build muscle, more energy, improved concentration or all of the above, your food foundation ensures your body is consistently provided with the right fuel so you can be your best, mentally and physically. Now, I get that the last the thing you want is to feel like you’re in science class, so I’ll keep it as simple as possible. What you need to know is that your eating foundation is something called PFC Every 3. PFC Every 3 means eating a balance of Protein, Fat and Carbohydrates every 3 hours to keep your blood sugar stable. Your body’s fuel source is ATP, which is similar to the gas needed to fuel your favorite high performance car. ATP’s main source of fuel comes from glucose (sugar). When your blood sugar is too low, your body burns muscle and when it’s too high your body stores body fat. This is exactly why the idea of restricting calories or carbohydrates works against you achieving your health and tennis goals. When you Eat PFC Every 3 your body balances its blood sugar and builds muscle, releases stored fat and creates consistent energy. Basically, your body will work exactly how you need it to on the court. The good news is the info I just shared is your science for the day, now let me show you how easy it is to Eat PFC Every 3. You’ll see with the plate example below how your protein, carbs and fat balance the plate and also how a couple of the example meals on the next page have a protein that contains protein and fat. Here are six sample meals my family (my wife Abbi, twelve year old son Hunter and two year old daughter, Hope) and I eat together all the time. We are all athletes and tennis players, well Hope is a future tennis player! As you can see in these examples, eating PFC Every 3 doesn’t have to be a perfectly balanced plate every meal, especially when your protein is also your fat in that meal. It’s the concept and visual you want to understand, so each meal you eat always has some protein, fat and carbs to keep your body in balance and optimally fueled on the court. Most important, Mark Macdonald is a husband to his wife Abbi and father to their 12-year-old son Hunter and 2-year-old baby girl, Hope. Professionally, he’s a world renowned nutrition & fitness expert, best-selling author, television personality, international teacher and speaker, and entrepreneur who has coached everyone from celebrities to athletes to business executives to busy moms on how to permanently get their body back with cutting edge nutrition, fitness and lifestyle strategies. He is the founder of Venice Nutrition and the IBNFC: International Board of Nutrition and Fitness Coaching, author of the New York Times Bestselling books Body Confidence and Why Kids Make You Fat and How to Get Your Body Back, as well as a featured health expert for many national media outlets, a few being: Dr. OZ, CNN, HLN, Access Hollywood, NBC, FOX and Chelsea Lately. Mark is also a sought after keynote health speaker and continually speaks throughout the world.